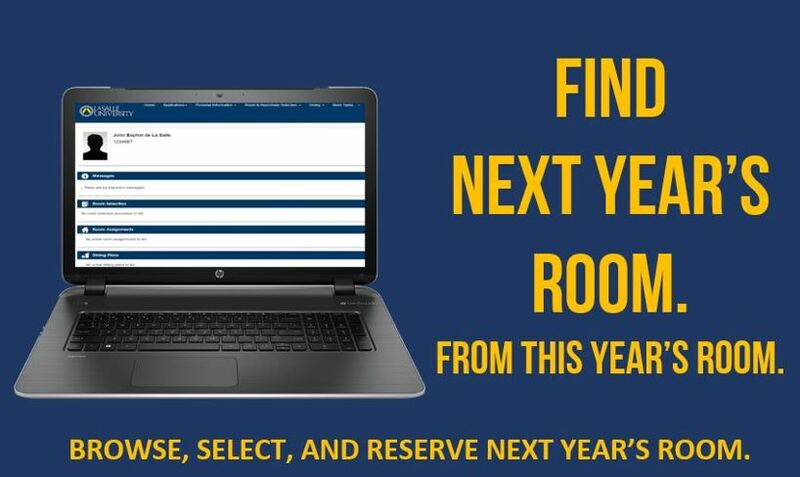 Since 2017, La Salle University has utilized an online housing selection process. This new system through the Housing & Dining Self Service has improved both the housing selection process and our ability to communicate and respond to residential students needs. Housing applications for returning students will be available beginning on Friday, November 30, 2018 through the Housing & Dining Self Service on the mylasalle portal. More information about the housing application process can be found in Step 1. Returning Student Presentation: this file (below) is a presentation (Powerpoint) shown at information sessions. Please use this as resource, along with the guidelines below and on other pages of this website. Direct all questions to our office: Union 205, housing@lasalle.edu, 215-915-1370. Thank you! Incoming (New) Student Presentation: this file (below) is a presentation (Powerpoint) shown at information sessions. Please use this as resource, along with the guidelines below and on other pages of this website. Direct all questions to our office: Union 205, housing@lasalle.edu, 215-915-1370. Thank you! We sponsor meetings for students to meet their potential roommates and host a ‘find your roommate’ site. We do strongly encourage students make their own groups and have a backup plan. Full-time undergraduate students are to indicate if they will be residing on-campus, or commuting from an off-campus address. All Freshmen & Sophomores will be required to live on-campus unless living with a parent or legal guardian. Resident students needing to stay on campus during the winter holiday break period will be able to apply to live in St. Basil Court, the townhouses or the apartments. View the information page for new, incoming freshmen and transfer students. Please note that the Housing Selection Process (Steps 1 through 3) is for current, returning students only. The “New Incoming Students” page describes the process for new students. Stay on top of news and announcements regarding the Housing Selection Process. Follow us on Twitter. Spend more time on Twitter than Facebook. No problem. Smoking outside will only be permitted in designated smoking areas. In addition to the current policy prohibiting smoking inside all residential facilities, all exterior locations within each residential facility will also be smoke free. Each location will have a posted designated smoking area with the exception of La Salle Apartments. For maximum options apply for housing prior to the roommate grouping process which concludes March 1. You must apply prior to participating in Housing Selection process. No Housing Deposit for Returning Students. Missing a Step. If you applied for housing after the regular process ends, we will contact you individually and provide you an opportunity to select from available accommodations.